This cool old map was drawn up by the Post Office in their never-ending effort to deliver our mail through snow and rain and heat and gloom of night. 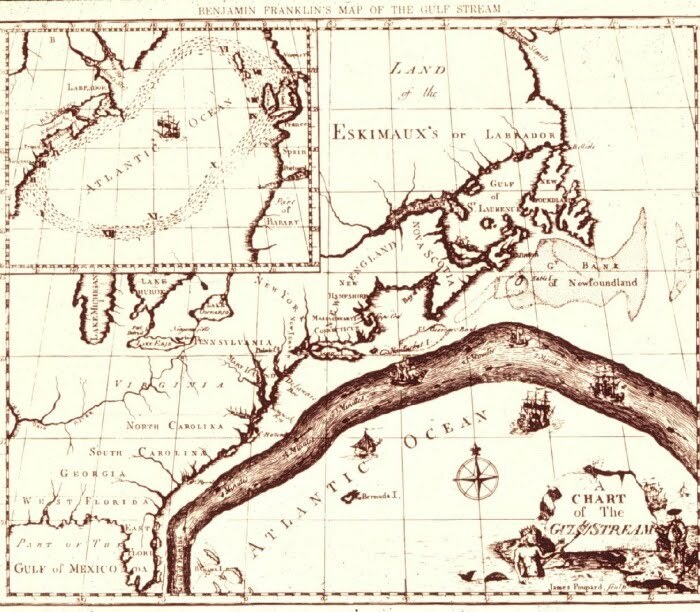 It is the first known map of the Gulf Stream current, and it was created by Benjamin Franklin, then Deputy Postmaster General of North America. The problem that prompted Franklin to make this map was complaints of poor postal service (some things never change). Postal customers in England found that letters they sent to the colonies took much longer to arrive than letters sent the other direction. Even when two ships, a postal ship (called a "packet ship") and a merchant ship, left England at the same time, the merchant ship always arrived first. Surely the letter carriers were lollygagging? Franklin looked into this customer complaint with his usual scientific curiosity. Having crossed the pond himself before, he knew that certain parts of it contained "gulph weed", a type of seaweed that grows in tropical waters. He had also noticed the eastward flow of this current, and called it the "gulph stream". Franklin suspected that this "gulph stream" was the reason for his postal problems. But first he consulted with an expert, his cousin Timothy Folger who was captain of a whaling ship. Folger explained that whaling ships often followed the gulph stream, because whales liked to eat the plankton that flourished in it. And he could attest to the fact that the gulph stream moved like a river within the ocean, noticeably quicker than the water on either side. With Folger's assistance, Franklin drew the first map of the Gulf Stream. On later trips across the Atlantic, as full Postmaster General, Franklin measured the temperature of the water. He found the water to be warmer within the Gulf Stream, and noticed that it did not sparkle at night like the colder water on either side. Before Franklin's map, some mariners knew about the Gulf Stream and others didn't. This knowledge was a valuable competitive advantage, not something to share with the world like Franklin the scientist wanted to do. But even Franklin eventually realized the value of this information, and stopped distributing the map in England during the Revolution. He instead made sure it got into the hands of the French sea captains who were supplying the Americans. I learned about this interesting intersection of science, commerce and war in the book The Invention of Air by Steven Johnson. This book is about Joseph Priestley, and includes a lot about his close friend and mentor Ben Franklin. Priestley later replicated Franklin's measurements of the Gulf Stream. Fascinating. Thanks for the lesson! Very cool! I like Franklin's Gulph Stream, it looks like a crazy big worm or a tree branch. Any ideas about the origin of the name "gulph weed"? And, did he ever figure out why the merchant ships made it faster than the postal ships? Maybe the merchant ships knew to stay out of the gulf stream on their way back, but the postal ships were trying to sail against the current? As a Post Office employee, let me assure you- we never lollygag :) (LOVE that word! )And this is a great post- many thanks. How old is this map? Honor, what occurred a couple of weeks personalized shirts ago to the Navarro family is a tragedy, Elturk said Tuesday. Whole family, including Fernando, are devoted and in mourning. The request today is to allow Fernando to mourn with this family. A 55 year old woman told officers her j cole shirt husband, Jeske, slapped her twice, told her she loved her dogs more than she loved him and threatened to kill the animals. The National Retail Federation estimates about 17 percent of people will return something we got for the holiday that didn fit, we already have or we don want. The stores are ready for the post holiday rush.